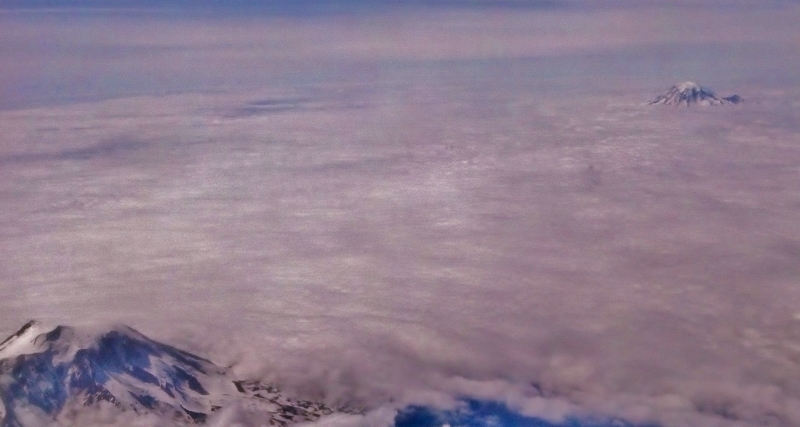 This evening we were on a flight home from Portland when i looked out my window and nearly in my lap was Mt Hood. I have flown by it multiple times but never as close as today. As we were marveling at Mt Hood further behind was Mt St Helens. Both were completely isolated from the ground, no other mountains around them, floating on a sea of clouds. I love flying. Since 1998 I have logged more than a million and a half miles with Delta. During the height of my traveling days I was on the road about 120 days a year. When I slowed down to 80 or 90 days a year I used to have moments when I stopped dead in my tracks with that momentary heart-sink feeling trying to figure out what flight I had missed. When I was home more than a few days before flying out again I began to have a vague background worry that I was missing something. Of course, during that time what I was missing was what went on at home. For years I stumbled in, hung my suits in the closet, dumped the rest of the clothes in the hamper, slept at home a few days, tended to mountains of paperwork, packed my suites and my now-clean clothes that my spouse had washed and went out again. During my professional career in Idaho, when I flew out of Pocatello, there were two options for destinations. I could be headed to Boise on Horizon Air or to Salt Lake City on Delta. I remember once asking a fellow passenger, “Where is this plane headed?” They were too shocked to respond. A quick look around the plane reminded me that it was a Delta plane so I must be going to Salt Lake City. I still could not remember where I was headed after that. I traveled less in the last few years before I retired but I still managed to log 75,000 or more air miles per year. Some of those were to see family but a lot were still work. This year I am struggling to keep my elite flyer status. I just don’t have enough places to go to pack in my 75,000 miles. We knew that we would travel less after retiring because we did not need to do business travel and because our household income could no longer support the personal travel we had grown accustomed to. Between January 1 and May 25 I did not sleep anywhere but whatever we called home at the time. I did not get on an airplane for 144 days. In fact, I had not gone farther away from home than 25 miles for 144 days. On our trip to Portland we spend time with folks who had known me during my heavy travel days. When I noted that I had not been on an airplane for 5 months it was a sobering moment for all of us. My life really had changed. The wildfire that burned our home has been such a dramatic part of our lives for the past two years that things like not being on an airplane for a third of a year faded into the background. In fact, in those 144 days I had not been farther than 25 miles from home and that only a few times, mostly to go to the doctor. The house and all of the tasks of finally getting our lives re-constructed completely after the fire have been all consuming. I have tried to figure out how I feel about not being on the road. Back then I got tired but I really liked the travel part of my job. Not all of the trips and not all of the time but being able to connect to colleagues and projects across the world was exciting. Sometimes I dragged myself to the plane and once I even overslept so badly I missed my plane completely. Mostly though I looked forward to the travel. Since the fire I have looked forward to being home. For nine months after the fire the only travel we undertook was to family and even that was limited. We finally went on a trip on March and then one in May but neither were what we had hoped they would be. We just wanted to stay home. We wanted to have a home. Tonight when the plane its final approach we looked out the window and saw our mountains. As breathtaking as Mt Hood had been our valley and mountains were ours. We were coming home. When the plane door opened and we stepped out into the brisk air and stood on the tarmac waiting for our carry-on suitcases that would not fit inside the small plane, the cold, wet wind felt good to me. As we drove from the airport toward our town and then continued west out of town to our house it was good to be coming home. It was only the second time I have flown in and headed to our house rather than to a hotel or holiday condo so it is still new and unique. I thought about floating on that sea of clouds with Mt Hood and Mt St Helens. I thought about their isolated beauty when no other geographical feature showed but theirs. The beauty was tempered by my recognition of how the smoke from the fire was like the clouds. It had set me out like Mt Hood and Mt St Helens. My head was above the smoke and it was clear around me but I could not distinguish well the features of my life on the ground as they churned around in the smoke. The smoke from the fire is mostly gone. I may never clear completely but now that we have a place to come home to, and the feeling that we belong here, I can venture out again. I can be out there knowing there is a home waiting for me to return.